On April 12, Scottish fisherman Andrew Leaper discovered a message in a bottle off the Shetland Islands that had been adrift for 98 years, a world record. 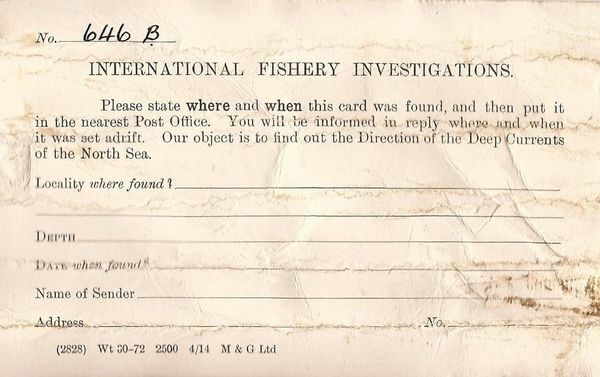 The message within was a postcard that requested the finder provide details about where and when the bottle was found. It was all part of a deep ocean current study undertaken back in 1914 by Captain C. Hunter Brown of the Glasgow School of Navigation. The Marine Scotland Science agency still maintains Brown’s log from the experiment. Of the 1,900 bottles released in 1914, Leaper’s bottle was the 315th to be found and reported.